The easiest way is of course to have as little as possible on your to-do list when time is up. This is of course easier said than done, but never the less the truth. 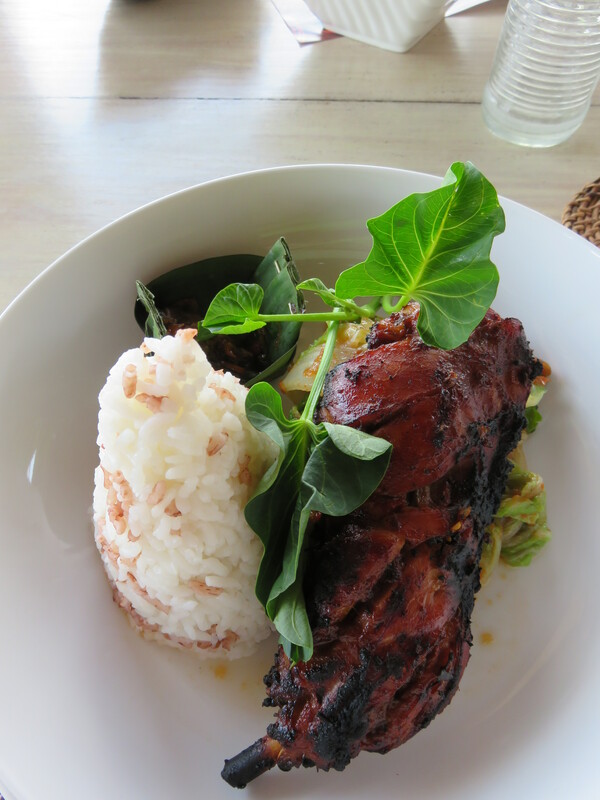 We have now 7 days left in Ubud and have a to-do list with a few bullets on it. Today we are, in between yoga classes, renting a motorbike and getting things off that list. 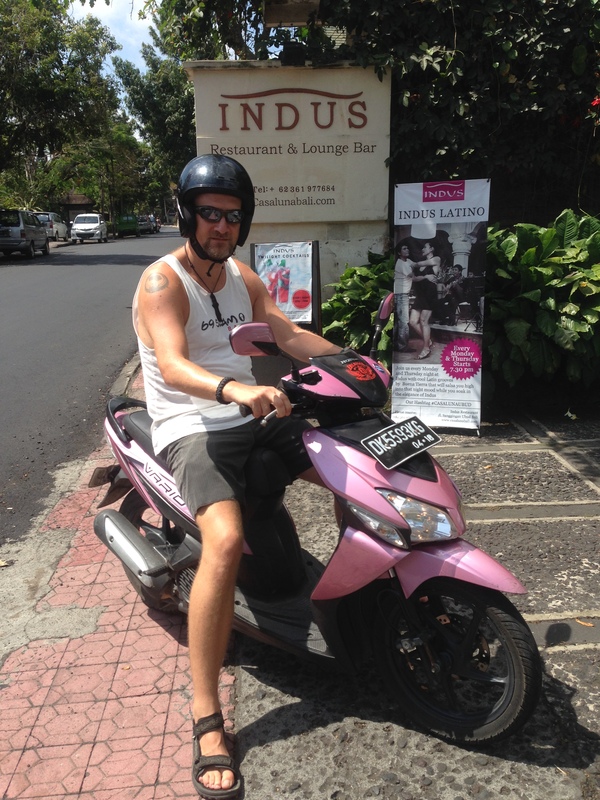 Drive a pink scooter in Asia – Check! Some of these things can beads public, others have to stay private for now. To ruin surprises by putting them on the blog would not be fun. 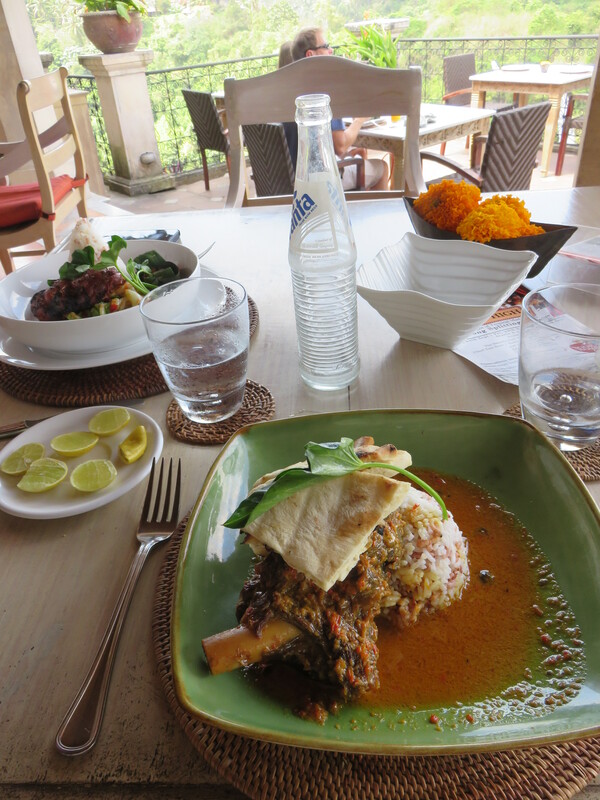 But we will be having lunch at cafe Indus, which we visited when we were here last in 2010. 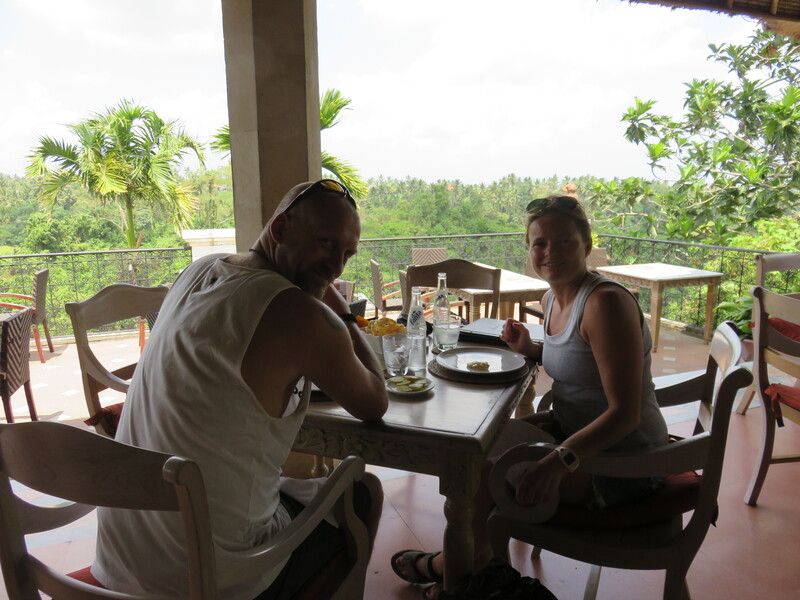 Then we traveled with Jeff, Julia and Emanuelle and had lunch at a cafe with great views of the rice terraces. We believe we know where that is and are now heading there. Just a quick stop by the photo store to make the picture for the chef at Warung Local (you remember the picture I posted about a week ago? ), then by the laundry to drop of sweaty and dirty clothing. At the restaurant we found it to be as it was last time. Why change a winning concept? Great view makes up for any other shortcomings in this country. @ cafe Indus – Check! Right now we’re waiting for the food, which is a bit pricy, but hopefully good. Edit: yes it was! Katja ordered a Lamb skank and I a flame grilled chicken. Both were really really good, but. As in almost all places so far the portion size leaves a little to be wanted. We also bought some coffee to send back home at Anomali. They use a blend in the Cafe latte they serve here, so we don’t know if we’ll be able to reproduce it at home. But it is worth a try. Next stop: Post office. We’ve said many positive things about these guys already, and they kept up appearances today. They are as service minded as ever, and we got to ship several packets away. It’s very nice to see that there are no corruption and no “ripping off” tourists. When we needed envelopes, the manager says something (that sounds) rather harsh to then clerk who then comes back with two different envelopes. “This to expensive for that”, was the explanation. Only one heavy envelope needed, the other could be cheaper and lighter. The cost is low, even on the heavy one. One dollar for that one, but only twenty cents for the other. I like the fact that they appear to be on my side. Then it’s back to the hotel. Change of clothes. Half sprint to Yoga barn. Vinyasa flow. Puuh, relax in Savasana (corps pose). 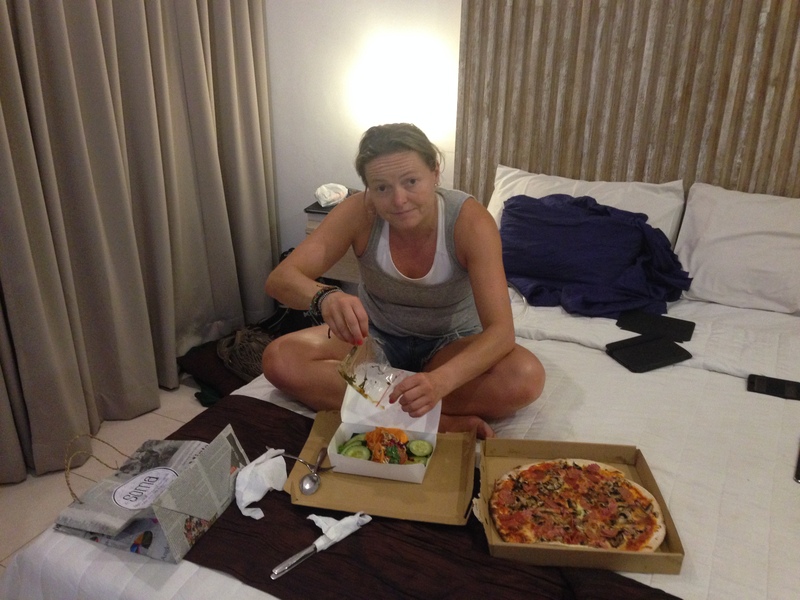 For dinner we did something we have not done yet – Take out – in bed. We got ourselves food from to different places and relaxed in bed with food and a TV-show. Then we had a nice long chat with Mamma and Pappa. 🙂 My parents. Dad turned 78 yesterday, and we skyped with them for a while. It was nice to see them and hear their voices again. To bed early to get ready for the next days cooking class. We’ll get picked up at 7 o’clock. Ba safe, have fun and stay frosty!